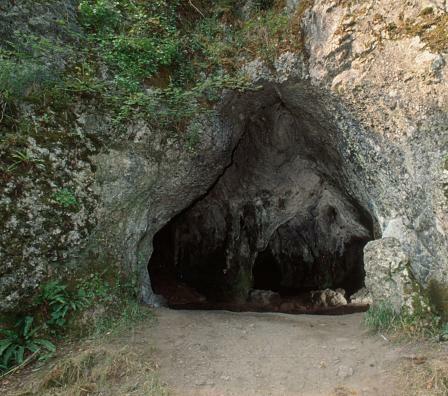 The cave dates to a period of early modern humans, who were the first to develop cave art. Cave paintings from this period have survived in France and northern Spain — areas unaffected by the return of the glaciers. 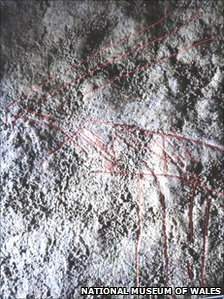 No cave art was known in Wales until last year, when a small carving of a cervid, probably a reindeer, was discovered in a small alcove in another Gower cave, its location being kept secret as it has been damaged. This evidence, coupled with the evidence found at Paviland Cave, which has produced a significant amount of material, builds a detailed picture of how the earliest humans lived and how some special individuals were treated at death, around 26,000 years ago. The ‘Red Lady’ of Paviland was discovered by William Buckland, Professor of Geology at Oxford University, who actually thought the burial was of a prostitute, due to the large amounts of ochre on the body, and assigning it a woman. It was later discovered, as several other scientists examined the bones in the next decades, the body was actually of a young man. The ‘Red Lady’, when alive, was a healthy adult male – aged 25-30, about 5′ 8″ (1.74 metres) in height, and possibly weighing about 11 stone (73 kg). As you can see in the images above, taken at the National Museum of Wales, Cardiff – the bones were deeply stained with red ochre, and the grave goods – ivory staff and bracelet fragments, and perforated periwinkle shells – were all similarly stained. The skull of a mammoth found nearby may have been part of the burial goods. It has also been suggested that the body could have been transported from somewhere further south to a distant, venerated site. The burial itself must have been orchestrated by another powerful individual, and it seems clear from the archaeological evidence, these people possessed considerable local as well as more far-flung knowledge. Evidence suggests that they used imported flint for engraving tools, and flint blanks were imported to the site as curated items. 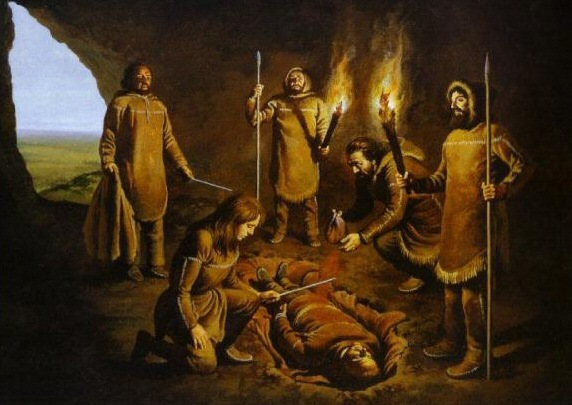 The ceremonial burial of the ‘Red Lady’ may have been one which encompassed a shamanic worldview. There is definately a suggestive element of the apparent interplay between art and consciousness, combining together to form a burial ritual which was both symbolic and very creative. The burial itself is reminiscent of others across Europe in other ceremonial acts. These include an extended burial position, positioning of the corpse along the cave wall, the presence by the grave of large herbivore remains, the placing of stone slabs at head and feet, the use of ochre, the deposition of personal ornaments, and the possibility that the body may have been headless when interred. No head was found at Paviland. There are several ornaments and objects placed with the Paviland body that points to a shamanic burial. The first, as already mentioned, is the ochre staining. Red Ochre is often used as body paint or to adorn costumes, fabrics, or power objects in preparation for the most sacred rituals of many cultures. Ochre is also used for healing directly – as it is strikingly similar to blood. The second object that may be significant is the shell necklace. Shells are frequently incorporated into shamanic costume along with other beads and bones, but also organic objects like feathers, grasses and wood – pieces of which may have originally been placed with the Red Man of Paviland, but have disappeared long ago. Come and try your hand at making a shell necklace with us at our festival stand this summer. The third and most suggestive shamanic object is the ivory present within the burial. 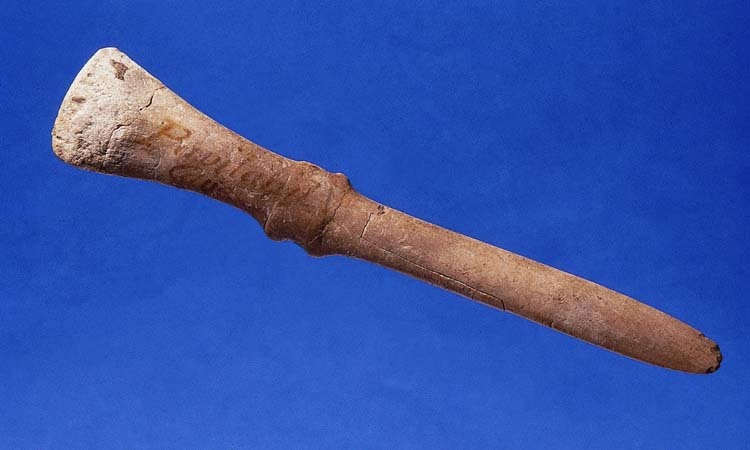 This particular ivory object may have been used as a staff or rod, a characteristic shamanic object. Shaman’s are known to work with powerful objects such as staffs, and through these objects it is possible to amplify the available spiritual power. For many peoples, the shaman’s staff is a representation of the connection between the realms of upper, middle and lower worlds and functions as a model of the World Tree. As with all true power objects, the staff becomes a living presence. As such, it is a catalyst for change and transformation – even capable of working on it’s own on behalf of the shaman. A shamanic object associated with the Paviland burial? In the ancient world, the sacred and profane were blurred. People didn’t think like we do in the Western world today. We think of ‘trees’ as natural, and ‘humans’ as cultural. For the Red Man of Paviland, it seems that nature and culture were one and the same.